NOTE These pages are ‘under construction’. Cavan Burren Rocking Stone – How did it happen? 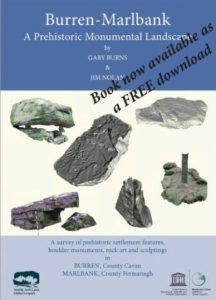 Rocking stones have defied both archaeologists and geologists who have been unable to either show that they were human constructs or to show that they were, or were not, natural. They are quite ‘incredible’ as either natural or human monuments – they seem to be almost impossibly easy to push whilst returning back into position. The Cavan Burren Rocking Stone is incredibly delicately balanced as it moves with the slightest touch and returns to its original position with ease, in fact it does more – it continues to rock back and forth. Yet it is quite simple to show how it is not natural and to demonstrate the work undertaken to create it – yet it not as easy to show how the engineering design was achieved. By using diagnostic techniques developed for identifying modified boulders during the Burren-Marlbank monument survey the ‘Rocking Stone’ can be shown to be a human construct. The Cavan Burren Rocking Stone has very obvious removal of numerous large, and small, slabs – it is clearly a Shaped Boulder – one of dozens in the Cavan Burren. So how does this fact demonstrate that the ‘Rocking’ effect was deliberately created by this work? As the Rocking Stone depends upon its ‘incredibly delicate balance’ it would have been impossible for the boulder to have been originally capable of rocking and then to have the extensive, and high impact, work done on it to remove the slabs. The slabs must have been removed in order to achieve that ‘incredibly delicate balance’. One obvious objective of the reshaping was to reduce the roundness of the boulder by removing slabs from the sides and by taking a large chunk out of the top section. All of these measures were to lower the centre of gravity by making the top sides of the boulder lighter and to facilitate side-to-side rocking. It can be compared to a child’s ‘roly poly’ toy with its weighted base and long pointed top . The further removal of incremental smaller chunks was in order to achieve that delicate balance not unlike removing weights from one side of a balancing scale. What is amazing is how this was achieved using a 3 ton glacial erratic and a limestone pedestal – and more amazingly how it still is in ‘working order’ after millennia! (Note: Although there is a comparison with the roly poly there is a difference in that the roly poly has a hemispherical base, and can wobble in multi-directions, whereas the rocking stone rocks on a one-way linear fulcrum like a see-saw). Fortunately this incredible monument can be validated by the presence of a second, ‘working’, rocking stone in the Cavan Burren which has similar construction techniques and it also has a removed section still in situ, alongside, which can be ‘refitted’ to demonstrate the ‘fine tuning’ on the main rocking stone – an evidence boulder. The Druid’s Chair is a signposted feature in the Cavan Burren. It has been shaped to resemble a high backed chair. It has been been created by the removal of a large chunk which is still lying alongside and is probably a deliberate part of the monument layout. Two people can sit comfortably on the ‘chair’ section. It can be made to rock with just the slightest touch though requiring slightly more force than for the ‘Rocking Stone’. It continues to rock for several cycles. Note that it is not just a matter of pushing it over slightly with it returning to rest but rather it continues ‘rocking’. When the removed chunk is ‘refitted’, using 3D manipulation techniques, several sections of overlap can be shown indicating the additional pieces that have been removed from the chair section, a good example of a shaped boulder. The boulder has a chock which forms part of the, linear, area of contact and the rocking fulcrum. The removed section lying alongside is similar to the many sidestones identified during the Burren-Marlbank study.